The following should fix the functionality of Red Alert 2 on Windows 8 and Windows 10. Please follow the instructions in this thread. Note that this fix should work with the Origin version of Red Alert 2 as well. Although the ALT+TAB functionality does not work. 1. Download the files needed to apply the fix from below. 2. Install the compatibility database by opening it's folder and double clicking the file called "Double Click Me". 3. Copy the game files from their folder (that is named "game files") into the folder that you installed your game in. 4. 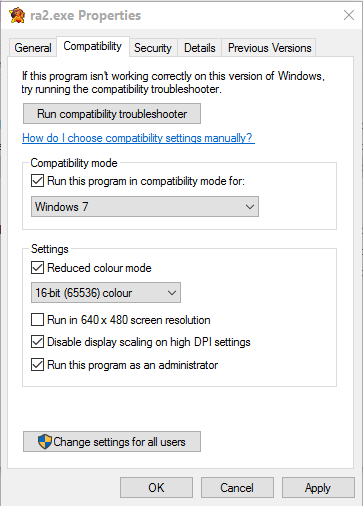 Apply the compatibility settings to all of the .exe game files as shown in the image "compatibility settings". 5. Try to run the game (ra2.exe). If the game doesn't run, post back with the following format. The download is sponsored by cncftw.com and the hosting is provided by Dylan Van Antwerpen. Edited by FReQuEnZy, 13 January 2017 - 10:20 PM. Thank you Martin! Did you fixed the lag? Good Job! It would be good if as many people with windows 10 as possible could try this and report back. I will wait for the same. I used windows 8/8.1 and it worked fine but no alt+tab at all. When I uploaded to win10 the graphics doesnt work propely and I decided down to win7. My laptop is a Dell Precision M3800 w/ Quadro K1100 graphic card. If alt tab doesn't work you could run in windowed mode. First post has been updated at 19/9/2015. Could this be applied to Windows 8 users having problems as well? Edited by hardman, 19 September 2015 - 04:38 PM. Yes. It's built from a Windows 8 fix. I installed ra2 on win8 yesterday for shuk and apparently it runs perfect with auto SS. All I did was install the XWIS version and change the game.exe file to an old version of ra2 I have. Does the win10 fix run flawless? Does alt-tab etc work Martin? Everything should be in the first post. When I installed RA2 from XWIS it worked the first time I ran it, but the 2nd time the menus dissapeared and alt-tab doesn't work for me. I got it working after that by using TS-DDRAW, but only on the skirmish side, as the game menus got very laggy when entering the lobby, but only sometimes. Eventually the game would just freeze in the lobby. When I did manage to get into a custom game the gameplay was very slow. I tried a lot of different configurations to get it working. The changes that I made are as follows. Made a compatibility mode with compatibility administrator toolkit specifically for game, ra2, red alert 2, executables. Enabling modes 16BitColor and 8and16BitTimedPriSync. Removed AllowModeToggle=no, AllowVRAMSidebar=no, VideoBackBuffer=no from RA2.ini as they were causing weird lag and inconsistent performance. Added a more recent WOLAPI.dll v1.20.0 as opposed to v1.16.0. Used compatibility modes from properties, disabled display scaling on HIGHDPI, enabled 16BitColorMode (probably redundant), run as admin. Some of the changes are in this seemingly mixed up order, because I was trying everything and anything. In some cases the game would crash/freeze and I was unable to open the task manger or alt-tab back to desktop, forcing me to restart the game. It's work fine for RA2, but what about Yuri? Do you have any solution for it? Edited by cokeziiz, 22 September 2015 - 11:20 AM. I'll have to convert the same fix for Yuri's Revenge. the game in single player runs super fast, have to set it to speed 4.
like i said internet is not the issue or firewall its something to do with server settings and windows 10.. cant figure it out. Nothing really happens on the server side while you play. At the connecting screen the game forms a direct connection to your opponent. why do i get 50+ fps on GR and 30 fps on xwis then? soo with that being said.. why does it cause lagg with resolution of 1920 ?? i have samsung 27" se390 and win 10 recognizes it as a Generic pnp monitor..
could driver issues with monitor be causing lagg? High resolutions cause a performance drop in all applications & games. Seeing as it puts a higher strain on the system and due to the game being so old, it can't leverage the full power of your graphics card. There's probably some configuration issues with the way you have set up the game. If the game works fine in GR then I'm assuming that you have multiple game installations for different networks. The fix worked perfectly for RA2 (Origin version); I'm getting full framerates at 1920x1080. No rush, but is there any ETA for the Yuri's Revenge fix? Thanks a bunch. Hmm, I'll make one tomorrow. Edited by FReQuEnZy, 05 October 2015 - 09:04 PM. You know, it would start working for you, if you just posted where the problem is, instead of just moaning. Why don't you install W7? It isn't convenient for some people/ set ups. I myself resorted to buying an old desktop with XP installed. Guess what... no problems! Edited by hardman, 10 October 2015 - 08:01 PM. I installed and did according to plans. Problem for me was that when i launched the Game the menu was gone all together and nothing could be clicked. I tried the sulution described in the Troubleshooter thread and it did not work. Edited by M4lkavian, 13 October 2015 - 11:47 AM.